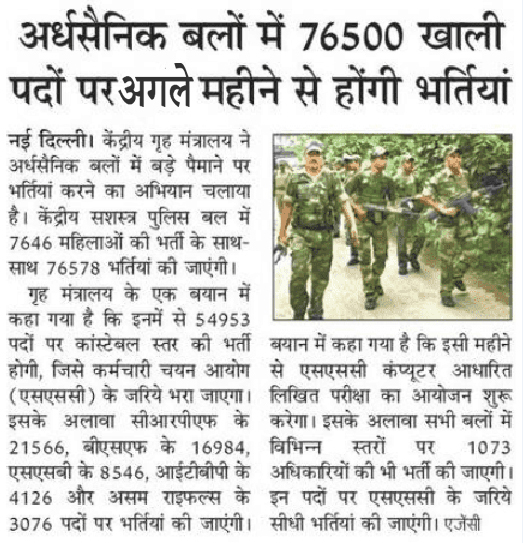 Staff Selection Commission (SSC) is inviting applications from eligible candidates for the post Constables. If you were searching jobs in Staff Selection Commission, then various vacant posts are available for you. It is best chance for applicants who want to make career in Staff Selection Commission. In SSC Constable Recruitment notification various vacant posts should be filled. Details of vacancies are given under. Application via online mode will be accepted only. Staff Selection Commission Constable Job advertisement will be published on fix date. Applicants may obtain details regarding this Recruitment from below segment of this web page which is created by team of ewebalerts.in. Read all instructions carefully before filling the SSC Online Application Form. Education Qualification ->> Applicants must have completed 10th Standard with good academic records. Age Limit ->> Minimum 18 & maximum age is 23 years. Pay Band ->> Selected candidates will get Rs. 21700 to Rs. 69100/-. For General & OBC Category ->> Rs. 50/- through Net Banking/Debit Card/SBI Challan Form only. No application fee for SC, ST and Ex-Servicemen. Selection Process ->> Selection of the candidates will be done on the basis of their performance in Online Examination, Physical Standards Test, Physical Efficiency Test and Medical Examination. For Males ->> 170 cms. For Females ->> 157 cms. For males only – Unexpanded: 80 cms and Expanded: Min expansion 5 cms. For males and Females ->> Proportionate to height and age as per medical standards. How to Apply ->> Interested applicants who are going to apply for SSC Constable Recruitment they need to fill online application form through official website of Staff Selection Commission that is ssc.nic.in before last date.